The following is Part Four of a series. Read Part One here, Part Two here, Part Three here. To summarize this series of articles (The Second Psychedelic Revolution) so far, I have attempted to provide both a rough outline and quick examination of contemporary (21st century) psychedelic culture by proposing that a ‘Second Psychedelic Revolution’ has arisen phoenix-like out of the ashes of the original 1960’s acid-and-rock n’ roll revolution following the deaths of its two most famous voices, Timothy Leary and Ken Kesey at the end of the Twentieth Century. (Part One). While undeniably influenced by the First Psychedelic Revolution, the current interest in readily available ‘research chemicals’, organic tryptamines, neo-tribal ‘techno-shamanism’, and Visionary Art—the defining parameters of this ‘Second Psychedelic Revolution’—have come not from the influence of Sixties psychedelic culture, but have evolved largely out of the publication in the early 1990’s of the collective works of the three seminal architects of this new psychedelic era—the chemist Alexander Shulgin (PIHKAL and TIHKAL)(Part Two), the author and mycologist Terence McKenna (The Archaic Revival and Food of the Gods)(Part Three) and the ‘Visionary’ artist Alex Grey (Sacred Mirrors: The Visionary Art of Alex Grey). The influence of these 3 authors, along with the unprecedented world-wide rise in popularity of electronic music since the birth and exportation of Goa-Trance during the same early 90’s era, has resulted in an entirely new psychedelic culture best represented today by the blossoming Transformational Festival movement inspired by gatherings such as Burning Man (which moved to Black Rock Desert, NV, in 1992) and the BOOM! Festival in Portugal (first held 1996). Ironically, this latest psychedelic revolution was initially much hastened by the now infamous Kansas Missile Silo bust of 2000 that saw a (luckily temporary) halt to the world’s LSD production; proving once again that Prohibition only leads to diversification. “My art has always been in response to visions. Rather than confine myself to representations of the outer worlds, I include portrayals of multi-dimensional imaginal realms that pull us towards consciousness evolution.” –Alex Grey. From what I can glean from Terence McKenna’s writing, he was never a great fan of LSD; he certainly never gave it much thought after he discovered the organic tryptamines (and especially magic mushrooms). Ken Kesey, who I have always considered the best authority on LSD and the 60s psychedelic culture that he undeniably helped create, very rarely ever mentions DMT in his writings, and according to his son Zane, was not much of a fan of it. On his deathbed, Timothy Leary was asking for cocaine and all anybody had was some DMT, which, Leary being Leary, he promptly smoked. When he ‘came back’ from what was his last psychedelic experience, Leary said in some confusion that he had just met up with William S. Burroughs in heaven. Burroughs meanwhile, despite the fact that his prose has become synonymous with opiates, was the original psychonaut-author, having written a book about his travels to Colombia and Peru in the 1953 in search of yagé (ayahuasca) in an effort to break his opiate addiction, (The Yage Letters), as well as being one of the first people to ‘shoot’ straight DMT ‘recreationally’ in London in the early 60’s. (An experience that terrified Burroughs so much that he wrote a letter to Timothy Leary warning him about the dangers of the drug). By the time LSD came along and kick started the First Psychedelic Revolution (with the enthusiastic help of Burroughs’s close friend Allen Ginsberg), Burroughs had apparently already seen enough, and he was a notable non-participant choosing to witness it all from the sidelines with an amused and knowing eye, his biographers now mostly erroneously reporting that Burroughs ‘didn’t like’ psychedelics. One man’s medicine can be another’s poison, one man’s heaven another man’s hell. An individual’s biochemistry can be a very tricky thing, and if there is one thing that history has established it is that there is no universal cure. The common ground in psychedelics lies in the actual experience itself—the mystical transpersonal experience being remarkably similar irrespective of the vehicle that takes you there—while the psychoactive compounds involved are merely different fingers that point at the same moon. In a 1998 interview with Alex Grey published in ‘The Entheogenic Review’, the interviewer (Jon Hanna) points out that describing the Psychedelic Experience had until that point mostly been the territory of writers, since other than the poster and blotter art of the psychedelic 60’s, few visual artists have openly admitted the influence of psychedelics upon their work. With the publication of Sacred Mirrors: The Visionary Art of Alex Grey in 1990, the psychedelic community soon discovered that the art contained within its pages resonated to many like miraculous snap shots of the psychedelic realm, faithfully rendered vistas brought back with great skill from the far shores of the visionary experience. And when Alex and his wife and fellow-artist Allyson Grey first addressed the Psychedelic Community at the Mind States conference in Berkeley, CA, in 1997, they discovered for the first time an enthusiastic audience to whom they didn’t have to apologize for their own psychedelic use. 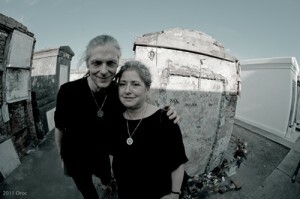 Since this fateful nexus, Alex and Allyson Grey’s influence on psychedelic culture has been unparalleled. 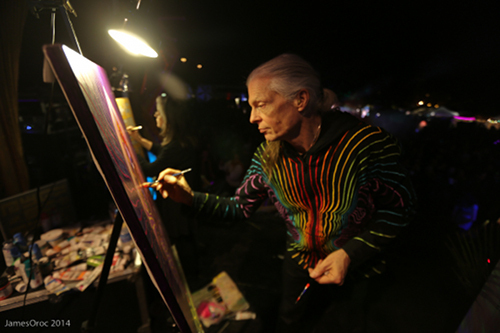 The use of Alex Grey’s artwork on the album covers and stage shows of bands like Tool and The Beastie Boys greatly increased his general popularity with youth culture, while the inclusion of his artwork in the actual Burning Man structure in 2006 essentially anointed his chosen status as this generation’s most important psychedelic artist. 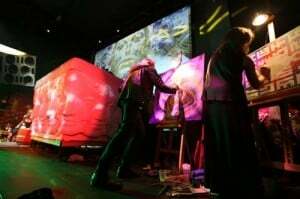 While still painting (often live on stage at major events and festivals), Alex and Allyson Grey themselves have embarked on what is probably the most ambitious psychedelic art project ever—the long-term construction of a Chapel to house the Sacred Mirrors series, and as a genuine pilgrimage site for visionary art. “The underlying primary psychic reality is so inconceivably complex that it can be grasped only at the farthest reach of intuition, and then but very dimly. That is why it needs symbols.’ –Carl Jung. In the earliest body of work that has established Alex Grey’s special place in psychedelic history, his art manages to blend the physical realms of the human body—a feat in itself only achieved by many years of training in medical drawings—with the psychic energy fields and auras of the mystics and quantum physicists, the knowledge of which has come to the artist from years of meditation, study, and contemplation. Human figures are stripped of their covering (“the skin encapsulated Ego”) to reveal a complex multi-colored system of organs, bones, veins, and arteries that can be seen to be generating rainbow fields and crackles of pure white energy that penetrate the vacuum in every direction, an effect that could seem ghoulish were it not for the presence of the subjects eyes, which gaze out at the viewer with an often astonishing humanity and are revealed as the true ‘windows of the soul’. Published in 1990, Sacred Mirrors; The Visionary Art of Alex Grey has now sold over 150,000 copies and has been translated into ten languages. The Sacred Mirrors series itself is twenty-one paintings that are conceived to be viewed as a single experience; and a kind of psychic ‘map’ to reconnect us with the spiritual by stripping away the various layers—the ‘biological, sociopolitical, subtle, and spiritual aspects of the self’—to reveal the universal essence. Later Alex Grey paintings show these figures complete with skeletons, veins, and aura fields, in the acts of prayer, dancing, loving, dying, … all powerful visual metaphors that seek to integrate the connection between body-mind-spirit, and the great mythologist Joseph Campbell’s assertion that the human body is a ‘bio-organic field-generator’; a series of energy fields that are generated by the body’s major organs—the chakra system in the Vedanta—and that combine into one singular field of consciousness that is the ‘ego’ of the human individual. Both mythology and great art often originate at the juncture of numerous competing and coalescing streams of human thought, and both Joseph Campbell’s ideas and Alex Grey’s art have arrived at a time where modern scientific thought is undergoing a radical paradigm shift as we move away from the old Newtonian ideas about singular points in time and space (a human construct) to the realization that the Universe is as series of interpenetrating fields being generated out of the Quantum Vacuum, and that all forces, (including most likely consciousness) that originate, and potentially operate, at this unseen quantum level. ‘The new spirituality in art—as well as in philosophy, psychology, and metaphysics—would have to be a Spirit approached more directly and immediately, not in mythic forms, but in direct intuition and contemplative absorption.’ – Ken Wilber, “In the Eye of the Artist: Art and the Perennial Philosophy,” from the foreword for Sacred Mirrors by Alex Grey. Alex Grey’s art is a powerful visual metaphor for a concept that is often difficult to grasp, so skillfully combining the scientific vision that our generation has become accustomed to with the ancient knowledge of akashic energies and aura fields that the two become effectively integrated, and a kind of transmission of teaching or ‘enlightenment’ occurs, often without the viewer having any knowledge of the complex entanglement of meditations and philosophies that have resulted in the artist’s singular view. Technically, Alex Grey’s paintings reveal great skill and years of training, while viewed from a strictly philosophical platform, they represent the hard-earned understanding of a significant philosophy, a viewpoint so clearly grasped that the artist is capable of transmitting that knowledge to others through the remarkable clarity of his vision. (Alex Grey himself often describes his art as a ‘visual philosophy’.) A stunning achievement, and one made all the more significant in these days of brutal prohibition by Alex (and Allyson) Grey’s enthusiastic championing of psychedelics (or entheogens as they prefer), and their frank admission that many of these visions have been delivered to them via the psychedelic experience. The most obvious example of how influential the publication of the art-book Sacred Mirrors; The Visionary Art of Alex Grey by Inner Traditions has been to contemporary psychedelic culture is the fact that the entire contemporary genre of what would have once been called ‘psychedelic art’ is now called ‘Visionary Art’ by the growing number of artists, curators, galleries and collectors who participate in it. The term ‘Visionary Art’, as mentioned by Ken Wilber in his introduction to Sacred Mirrors, Alex Grey has taken from the mystic-artist William Blake, and was encouraged by his editor Ehud Sperling to include it in the title. Alex Grey has said that after the unexpected death of Terence McKenna, he felt that he (and others) had felt the call to ‘step up and speak out about psychedelics’ to try and occupy the void in psychedelic culture that Terence’s early departure created. And one of the reasons that Alex Grey has become the most popular speaker on psychedelics since Terence McKenna—and perhaps the thing that separates him from other visionary artists—is the fact that there is a serious philosophy behind Alex’s work, and that he himself has been (and continues to be) one of the great students of psychedelic history. The fact that Alex Grey was more than just a great painter became obvious in 1998 with the publication of his book The Mission of Art that revealed the extent of his underlying philosophies. (I personally consider Alex to be a philosopher who uses painting as the main medium for explaining his philosophy.) Tracing the development of human consciousness though art, and the role of the artist as a kind of lightning rod for the future, the corner stone in Alex Grey’s philosophy comes from the assertion by the universal historian Arnold Toynbee (1889-1975) that the growth and decline of civilizations is a spiritual process, and that new civilizations arise to give birth to ‘better religions’. Proposing that the creation process of the artist is a mystical link with the source of the creation process of the Universe itself, and that Visionary Art itself can be the foundation for a new world religion, Alex Grey is the first major psychedelic voice since Aldous Huxley and Alan Watts to return the conversation about psychedelics back onto ‘traditional’ mystical grounds. A long time Vajrayana practitioner, Alex Grey’s personal psychedelic philosophy diverges sharply from Timothy Leary’s often politically-inspired rhetoric, or Terence McKenna’s fantastical talk of self-replicating tryptamine elves and the mushroom spore as a spaceship, by rationally arguing that psychedelics are in fact the most effective way for modern man to truly know God. In his incredibly popular slide-show presentation that he and Allyson Grey offer to promote the construction of the Chapel of Sacred Mirrors, Alex Grey traces psychedelic history all the way back to the cave painters and explains to his enthusiastic audiences that both psychedelics and art have been an integral part of the religious experience for thousands of years. The only speaker in the psychedelic community these days that has the power to hush a packed dance floor and make the kids willingly sit down, Alex Grey’s ‘pull’ has in fact become so great that when he and Allyson appear at festivals to live paint and give their talk/slide show, they are now often in fact the headlining attraction. For while Alex Grey’s work is pretty much entirely outside of the mainstream art world, these days he may well be the most popular artist in America. To learn more about the construction of the Chapel of Sacred Mirrors in upstate New York visit COSM.org. And perhaps even more importantly, the death of Jerry Garcia and the end of the touring of the Grateful Dead, the last link to original Acid Tests. In an appendix in my book Tryptamine Palace (titled ‘William S. Burroughs: The Godfather of DMT’) I argue that the inspiration for Naked Lunch (1959) Burroughs’ radical reimaging of the English novel, with its mugwumps, aliens, transforming typewriters, and other very psychedelic imagery, came from his ayahuasca experiences and not his opiate addiction as most commentators assume. 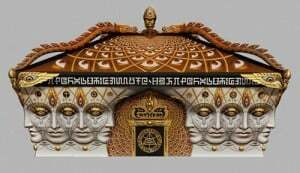 The Kickstarter campaign in 2013 for the construction of Entheon Hall, the first stage of the project, was the second best funded art project on Kickstarter ever, reaching 170% of its target and raising $210,000. The two artists have often shared ‘visions’ that have become the same foundation of their separate works; Allyson Grey also conceived of the Sacred Mirrors as a series, and the two artists constructed the elaborate frames for the paintings together. They tend to talk of themselves as a team, and very much act as one.